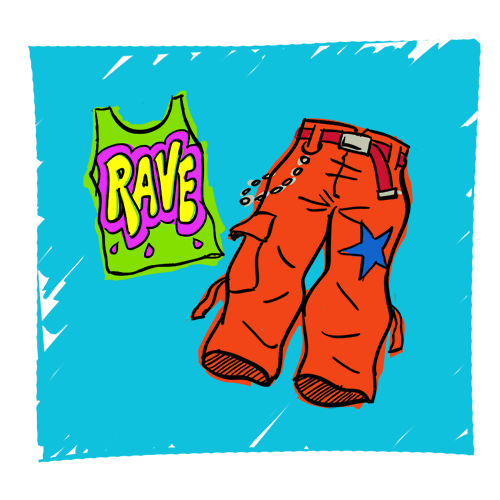 Ravers have a distinctive and brightly colored style. This way, they can easily identify each other no matter how f*cked up they are from drug use! 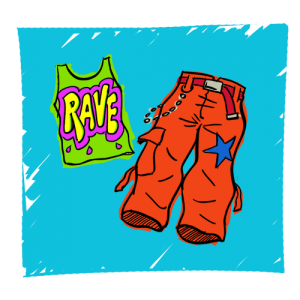 Make sure you got your dancing sneakers/flip flops on, so you can wear your raver dance clothes in style. Tight child size shirt with your choice of following characters: Rainbow Brite, Care bears or Strawberry Shortcake. With your brain so fried from the drugs, you can wander into traffic and be easily seen! Warning: Cars may or may not stop, depending on the driver’s attitude. Warning 2: If you live in Los Angeles, then you shouldn’t be walking. Nobody walks in LA! Any clothing that is UV reactive is also very cool. That way, you can strut about during raves, and everyone will be in a phantasmagorical* trance as they stare at your illuminating glow! *May or may not be a real word.